On Friday [September 20, 2013] Israeli soldiers violently attacked international diplomats, and prevented dozens of residents from rebuilding the destroyed Khirbit Makhoul village, in the West Bank’s Northern Plains.The visiting diplomats came from France, Britain, Ireland, Spain and Australia, including diplomats of the European Union’s political bureau, who tried to render aid to the displaced impoverished villages of Makhoul village that was displaced three times. A French diplomat was violently assaulted by the soldiers, and was dragged out of an aid truck. 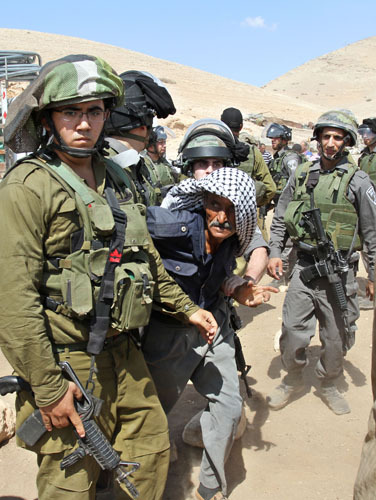 The Palestinian News & Info Agency (WAFA) has reported that the soldiers used excessive force against the residents who were trying to rebuild their homes and structures, and assaulted a French diplomat who visited the area in solidarity with the displaced villagers. WAFA added that the soldiers attacked several residents including children, reporters and elderly before kidnapping three residents and taking them to an unknown destination. Several residents suffered cuts and bruises after the soldiers violently assaulted by them. Furthermore, the army prevented a number of international officials from entering the area to help the residents rebuild their residencies, sheds and shelters, and confiscated several tents. The army also declared the area a closed military zone, preventing the residents and internationals from entering it. Khirbit Makhoul small Bedouin village was destroyed on Thursday for the third time in a row, leading to the displacement of dozens of families.